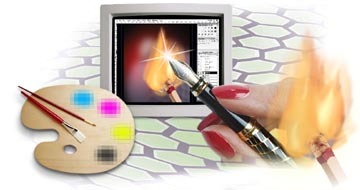 Photographix can scan, color-correct, sharpen and enhance any photograph with digital effects. We can work in resolutions capable of achieving photographic quality reproduction as photomurals many feet in width. Images are digitally edited to remove unwanted elements, change or add product logos and colors, add backgrounds or color and texture layers that blend multiple image elements together. We specialize in creating high resolution photographic compositions that give your exhibits a rich, uncompromising professional corporate image.